If you have a washing machine that is not pumping out the water and stuck full of water – don’t start here. This is the final advice if you’ve tried all the advice on my article won’t drain water. If you can’t find a blockage and the pump is definitely running – continue with this article. Of course if the pump isn’t running or is jammed then that is why it isn’t pumping out the water but if you can hear and see that the pump is running but water isn’t being pumped out read on..
Small objects may not be noticed. They could be underneath the impeller, wrapped round the impeller or stuck inside the pump chamber out of sight. An elastic band or elastic from a hair bobble, a small piece of torn strap from a bra, a large piece of grit or stone, a small screw, a piece of plastic etc. items like these and other similar obstructions could all cause the impeller to slow down and not be capable of creating the vortex required to force out the water. Rubber bands and similar can wrap around the impeller restricting its movement. Other items could get trapped underneath the impeller out of sight and also restrict its movement. In all these cases it should be detectable by trying to turn the impeller with a finger or screwdriver (with the machine unplugged of course!). It should move freely. However, some impellers may feel like there's a small resistance which when overcome allows the impeller to jump 180 degrees round. Then another small resistance needs overcoming before it jumps round again. Without knowing how free an impeller should be it's hard to diagnose but if one is quite tight all the way round it is probably obstructed. A button of a specific size could be small enough to get through the pump filter and even past the impeller, but then get jammed inside the pump outlet chamber where the drain hose attaches to. This would be invisible unless the drain hose is removed and you look into it. Another common blockage here that can remain undetected is a small piece of a bra wire that got through into the pump outlet chamber and has jammed inside. Subsequently most of the fluff and threads that would normally pump away can get snagged on it and build up into a blockage. A button of a specific size could be small enough to get past the pump and into the drain hose, but be too large to pass through the drain hose or through the plastic spout on the u-bend that the drain hose may be connected to.This could completely stop water from being pumped out, or it could even manifest as an intermittent fault. I've seen several cases where a button is jammed halfway up inside a drain hose or in the opening of the plastic spout of the u-bend connection but it spins round and acts like a butterfly valve. When swivelled round one way water can get past, but then the water flow can swivel it round again so that it stops the water flow. To check for this you'd need to disconnect the drain hose from the u-bend and examine the end of the drain hose and inside the spout itself to check for blockages. If necessary, the drain hose can also be taken off the machine to see if you can detect any obstruction. I've managed to clear some large obstructions by shoving the end of the drain hose onto the cold tap at the sink and turning on the water. Be careful though, you can easily end up spraying water everywhere. I use a large dishcloth over the hose and hold on tight. If there's no blockage though or it's something that's swivelled round and not closing off the flow you shouldn't feel much pressure. If the impeller is broken it could be spinning on the shaft. In other words although the pump rotor is spinning it is not turning the impeller that forces the water out or due to slippage on the shaft it is not turning fast enough. The pump could sound like it's running but in fact it is not revolving at speed inside, however, I would expect it to sound different to normal. It's even possible for the pump to be oscillating instead of revolving because of a fault causing it not to spin properly. You would have to use your imagination to find out if either of these are the case. It's relatively rare. This one is likely to be rare, but worth mentioning. I’ve recently had email contact from Michael, who had a strange fault where he could find no blockages, the pump was running, and it initially pumped a little water out then stopped. After some struggle and determined investigation he eventually discovered that one of the suspension springs on his Hotpoint Aquarius washing machine had broken (under the lid). This had caused the main drum to drop, which squashed the sump hose (the main hose leading from the bottom of the tub to the pump) causing it to kink. When he replaced the spring, the tub was held in its proper position and released the pressure on the sump hose allowing it to pump out properly again. Yes I faced the same case, Then I remove the spinner in the dryer.. There I found my tie, Even that was not blocked into the outcome water pipe. When dryer spins the tie rolls the pipe & stopped the drained water. My impeller keeps falling off. When I remove it and look at it, it’s not damaged at all, and fits back on the spindle perfectly well. So why does it keep falling off? Have I not fitted the filter cover on tight enough? Is that why it’s not staying in place? Hi Neil. They used to screw on (left hand thread) but chances are they are just force fitted on now and if one has come off it’s unlikely to fit back. Pump impellers use to be replaceable but as far as I know they aren’t any more so you will probably need a new pump. Check my 4washerhelp appliance spare parts facility to see this is the case or not. Wow, thanks for the swift response. So frustrating as it would be such an easy fix if I could screw it back on. Thanks for the help! Thanks Claire. Always good to get feedback from someone directly helped by one of my articles. The hair band round the pump impeller is a tricky one to diagnose sometimes as many people assume it needs a new pump. Hi. I read and tried everything in you article and my washer still drains slow enough to get the error code. I cleaned the lint trap, cleaned the drain, pulled the pump out and took it apart-pulling the impeller out and cleaning everything on the inside of the unit. I also drained the washer and set the unit to drain and spin causing the pump to turn on. With the drain plug pulled out I could see the impeller spinning around so I know it’s actually working. Should I throw the towel in and get a new pump or do you or anyone have any other suggestions? Thank you! Nils: As far as I’m aware the impeller shouldn’t normally come off. They are no longer replaceable as spares like they used to be. In the 90s the pump had a screw shaft and impellers screwed on. These days they are normally press fitted on. If the impeller is loose on the shaft it won’t pump out properly. I can’t say for certain, but how sure are you that the impeller is securely on the shaft and won’t spin on the shaft in operation? Thanks for the response. The impeller and shaft with the magnetic part all came out of the unit as one piece and the impeller is press fitted on the shaft. It seemed to turn ok by hand. I ran the drain function with drain plug out and watched the impeller spinning although there wasn’t any water. Is there some sort of pressure loss where is just won’t force the water out? 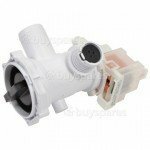 Looking online for a replacement part however the exact pump isn’t available, only ones that are supposed to fit. Have you tried my recommended spares site? If the pump is running and the impeller is spinning round the fault must be caused by a partial blockage or obstruction somewhere as described in my article. Obstructions can be anywhere before the pump, after it, or in the plumbing. Seeing if it will pump into a bucket will eliminate the plumbing though. The only faults with pumps preventing pumping of water (other than obstructions inside) are that they won’t run at all, or if the impeller has broken or come loose on the shaft the pump sounds like it’s running but the impeller can’t pump water. If you have totally eliminated all possible blockages or obstructions such as small coins or buttons stuck inside hoses which can’t be seen then of course it can only be the pump. I’ve put everything I can think of in the article. If it won’t pump into a bucket (at about 3 or 4 foot height) then it eliminates any problem in the plumbing system and leave only the drain hose and sump hose. You may have to remove the drain hose and get someone to help so you can stretch it out and look right through it to see if anything is inside. If it’s clear, take off the sump hose leading to the pump and check it, check the plastic ball (if fitted) isn’t sticky and sticking in the opening. If everything is clear the only option left is to fit a new pump. Being driven mad. Washer sometimes empties fine, but generally does not. Often get hot plastic smells from it when it has failed to empty. Have done the obvious, checked filter, removed pump, checked pipe work for obstructions. Usually doing a test rinse it empties fine, but try a full wash and it doesn’t empty at all. Power off for a few minutes and set to empty and it works. Suspect the pump is in some way intermittent, but don’t want to replace it and still have the problem. Hot plastic smells indicate the impeller catching on something or the pump overheating. Intermittent faults are tricky but to troubleshoot them you need to work out what’s different when it doesn’t empty. Is the sound different? Can you hear the pump running normally or has the sound changed? Does it sound like the pump has stopped running? If the pump is running but noisy when it doesn’t drain suspect a fault with the impeller, or something jamming the impeller, or an obstruction which keeps getting sucked in and out. If the pump sounds perfectly normal but no water is coming out look at the possibility of something inside the sump hose or the drain hose or even in the end of the drain hose where it connects to the plumbing as described in this article. I have same problem, I have checked every pipe and had pump out to clean, no blockage, the washer emptys when I lower hose into Bucket so that’s clear,and when I set to drain there is power to pump but doesn’t seem to work, should the impeller run freely? I replaced the pump and that seems to have fixed the problem. The drum of my machine is empty, but when I spin the drum I can hear water (lots of water). I replaced the pump and the repairman said it was normal to have water behind the drum for “balancing purposes”. I’m not sure I believe him. The machine smells, likely from the excess water. Any suggestions? Does this sound normal? If you haven’t already checked the pump filer – How do I clean my pump filter – where is the pump filter? Also, to combat washing machine smells – What causes washing machine smells? including the two other relevant articles linked to within there. Just wanted to say thank you! Tried pump and there was a bit of fluff and some hair grips but main blockage was in the drain pipe under the sink (as seen in picture). It was blocked by a button as described- machine now working. Wish I hadn’t bothered to pull machine out as now having a problem pushing it back in. Thanks again – saved a lot of money following your advice. In regards to the impeller… I’m unclear as to whether it is supposed move freely or turn with some resistance. Mine will move clockwise and counterclockwise, but it doesn’t spin freely like a spinner in a game board. It turns more “robotically”. I wish I could describe it better. It turns kind of like a second hand on a clock does, again, in both directions. It is NOT wobbly. Can you describe to me how I would know if the impeller is bad? I really appreciate your help! Hi Dtacy. Pump impellers used to rotate totally freely but for many years now most have been designed so that they rotate between two magnets so as you turn it there will be some slight resistance to overcome the magnet, it then rotates freely for a split second until it meets the second magnet. With this type of pump you can’t spin the impeller but it should turn around relatively freely with just the two resistance points. That makes sense. That sounds like what mine is doing. So should that lead me to believe my pump is working correctly? I have checked the hoses and found nothing obvious blocking either one. I also checked and cleaned the filter. I ordered a new outlet hose to rule that out even though water seems to be moving through the current one. I also checked for obstructions between the inner and outer tub and found nothing. If the pump runs and you can hear it running then unless there’s a small obstruction inside the pump chamber it sounds like it may be ok. You can check the drain hose by removing it, straightening it out and looking through it (although you will need someone else to help). Have you checked at the connection under the sink on the u-bend if that’s how the drain hose is connected? My drain hose leads right to the floor and into the sump pump. I took the hose off and ran water through it in the bathtub. I also ran two lengths of straightened wire hanger through the hose. I was able to free fragments of debris that looked like dirt and mold. But it certainly didn’t seem like enough to be clogging the hose (plus, like I said, water runs through it). I have so already took off and looked inside the hose that comes out of the tub and into the pump. The only thing that concerned me with this hose was that the gasket looking thing that was seated inside “male” part didn’t sit firmly. It fell right out when I took the hose off. (I’m referring to the part with the ping pong ball thing in it) Also, I haven’t actually watched what the pump is doing since its been accessible. I know something is happening because I’ve seen some water emptying in the sump pump. And there is not standing water in my tub. So I know it’s draining somewhat. It’s just that my clothes are drenched after the cycle is done. I have seen it spin quite quickly so I know the spin is working. I apologize for my horrible laymans terms. I’m just a single mom trying to wash my clothes without spending a ton of money! So I truly appreciate your guidance! Hi Stacey. If there is a ball fitted inside the sump hose and covered in gunge they can stick and stop water flowing into the pump. However, I’m sure you would have noticed if this ball was sticky and greasy. Other than that if the washing machine is actually going into a spin it would tend to indicate that the water is actually being pumped out, at least most of it. Washing machines don’t normally spin unless almost all of the water has been pumped away. If the water isn’t pumping away properly they will usually refuse to spin. The only common thing causing a washing machine to actually spin but leave laundry very wet is if there is a partial blockage which is just restricting the flow of water enough to cause this problem, but not enough to stop a spin. Or if there is another problem with the motor or drive belt. Whatever your problem is it doesn’t seem to be something you can fix yourself if this article and the points I’ve made still don’t help. Sadly there’s a limit to what can be done without seeing the machine. You have been more than helpful! Thank you so much for your time and advise! So… I replaced the outlet drain hose and also removed a fistful of coins from the hose that led from the tub to the drain pump. I successfully put everything back together and started a load. I’ve never seen the amount of pressure I saw coming from the drain hose! I watched the water level rise in the door and watched it cometely drain out. But, unfortunately my clothes are still wringing wet when the cycle is done. So after more investigating, I believe that my washer isn’t spinning as quickly as it should on the final spin cycle. It used to spin super fast, sounded like a jet was taking off. Now it’s not doing that. Just a moderate spin speed as if it’s just in the wash cycle. So, I am confident my hoses are clear and my pump is working. How do I troubleshoot and fix the spin cycle? Again, thank you so much for your help! I can’t believe I have done so much that many probably would never attempt! I’m determined to fix this thing! Also make sure no option buttons limiting spin speed have accidentally been selected and that the wash cycle chosen definitely should do a full spin. After that you may need an engineer.